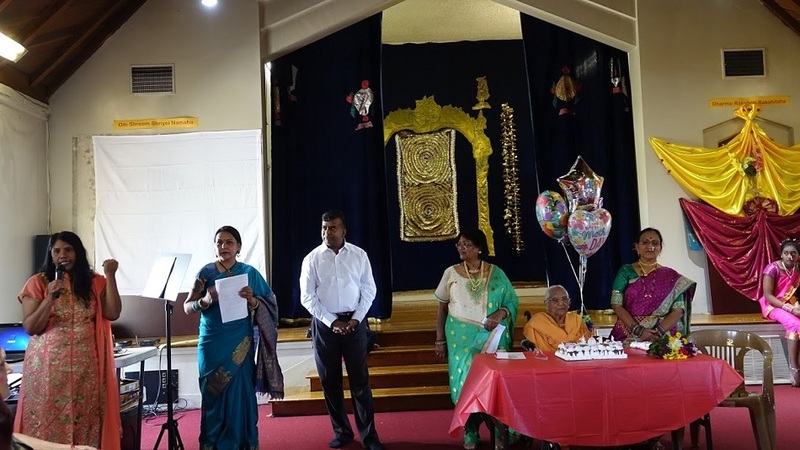 Aparna Hande was recognized as the Mother of the community and Ravji Patel as Father of the community for their selfless dedication and community services. Yatra-3-A musical dance drama-Depicting the Journey of Life hosted by Jasmin Human Services to celebrate Mother's day and Father's day, on May 5 at North Hollywood. The event began with Power point presentation of shining stars of Yatra-3, Life behind the Curtain to honor teachers/artistic directors and organizers and Jasmin Human Services. The event started with the celebrating 101th Birthday of Smt. Sumati Tilve who blessed the audience. 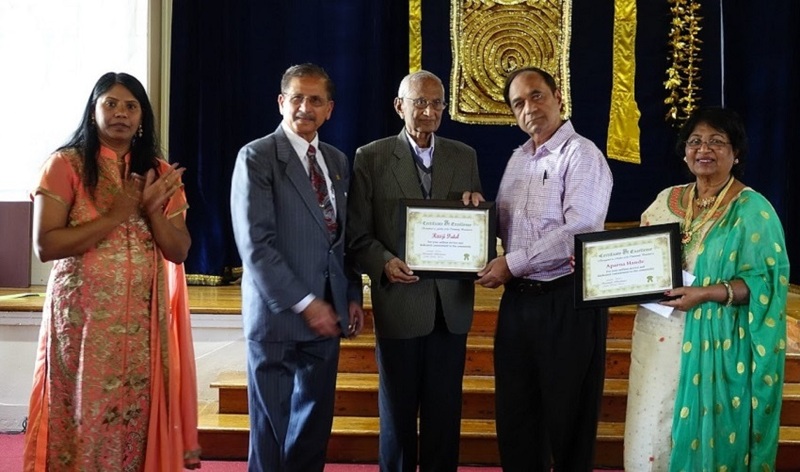 Aparna Hande was recognized as the Mother of the community and Ravji Patel as Father of the community for their selfless dedication and community service. Shri Ramesh Mahajan and Shri Keshav Patel honored Shri Ravji Patel and Aparna Hande. Vasu Pawar spoke on the significance of Mother's day and Father's day. Smt. Padmavathy Balajee rendered a invocation song with her beautiful voice followed by Choti Si Pyaari Si by Radhika Patel and Nila Parikh. Then Rachna’s DanzeRus rocked the stage with cute little Srikrithi Boddupalli, Samaira Bharti, Khanak Devda draped in Sarees. Pinga Dance performed by Sadhana Umashankar, Druti Kulkarni, Palak Tandon was eye catchy. Sabari Girish of Swarasagaram with Aditi Iyer, Prathana Girish, Yeshmita Ambati, , Nandika, Hrishab Krishna , Keerthana Girish presented soulful songs. Kamini Boora ;s students Anisha Singh, Diya Dinakar, Ria Kumaran presented a fast paced dance followed by. Nature Conservation Performance choreographed by Rachana was executed by Arjun Ramaswamy, Divyansh Agarwal, Rijul Garg, Priyanshi Agarwal, Aryan Ramaswamy, Mahsvin, Indu Garg, Rupa Param.Jasmin took to stage to present Shiv Tandav in a semi classical style. Kamini Boora’s students Anika Singh and Pranhitha Anoop were able to gracefully present their dance providing proof of their passion. Arathi Srinivas’s Natyadwani students Kavya Sreeraj, Nandini Iyer, Navya Sreeraj, Sahasra Muskula, Sridharini Singaravelan, Puja Malyala, Nikhita Pal, Tanvi Hosabettu presented a beautiful Bharatnatyam performance followed by Deepali Vora’s Nityashetra Dance Academy students Mokshaa Yuvaraj, Neha Manoj, Shreya Sambangi, Neha Sambangi, Srishar, Astha Munot, Parshita Garikapati, Fahima Karim, Anushka Naini stunning the audience with their perfect co-ordination. Paulomi’s Rangashree students Parnika Sivakumar, Lalitha Sabat, Pranitha Rao, SahitiYenamula, Amritha Vinjamury, Isabella Toy, Sai Sravya, Siri Gullapalli proved their endurance and perseverance with their passionate rendering. Lalitha Venkatraman’s Laasya Dance group with Anchita Hari and Namrata Hari kept the audience's attention undivided with their quick twist and turns. Priya Umashankar, Rekha Alle, Nivetha Kabilan, Charu Shivakumar danced for Padmavath song Ghumoor taking several spins on stage. Kamini Boora and Rashmi Kuchchal rocked with their fusion. Meenal presented Pinga dance with delicate moves. Aparna Hande and Rani Kusto delivered a skit addressing the challenges that people of 70+ years face with the possible solutions. Srikrithi danced for fly fly Butterfly Song with her charming expression. Rachana and Charu emceed the event. Rachana was very spontaneous with her poems. Swarit Srivastava as Vishnu, Nidhi Alle as Brahma, Jasmin Sivakumaran as Shiva won many hearts with their perfect make up and rendition of dialogue. DJ Mani provided the best service as always. Kabilan Krishnan provided assistance with the tech part. Dr. Avinash captured the event with videos and pictures. Charu thanked Vilas Jadhav, Ramesh Mahajan, Rachana Srivastava, Aparna Hande, Vasu Pawar, Keshav patel, Ravji patel,Rani Kusto, Meenal, Priya Shankar, Nivetha Kabilan, Rekha Alle, Prasad Putta, Radhika Patel, Anjana, Nila Parikh. Shivakumar Kuselaraghavan was the event sponsor. Himalayan Cuisine, Baldwin Park delivered lunch in time as promised though the venue was too far.